Why do I love DC? Because I HATE DRIVING. I guess I’ve changed a whole lot since I was 17 years old, when I kind of loved my summer job delivering food for Wing Zone around the suburbs of Atlanta. I met plenty of characters, sure, and getting tips for the first time felt like playing a slot machine! But the best part to me was driving around all day, blasting music for just me and the wings in the backseat. To me, this was freedom; no bosses watching over me every second and complete control over my playlist. These days when I contemplate driving, pleasant memories of deliveries, road trips, and burning donuts in parking lots don’t come to me immediately. Mostly I think about how I got a $100 parking ticket* within a week of moving here, then got harassed for not having DC plates. Or I think about that time someone threw a brick through my side window just days before Christmas, while my car was parked in front of a church, in order to steal nothing more than a couple awesome CDs like Smashing Pumpkins’ “Zeitgeist” and a sweet mix I made called “Maximum Chillaximum”. 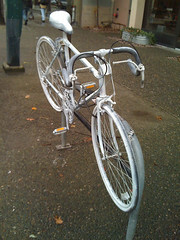 Bikes + scavenger hunt + Capitol Hill + potential to win awesome prizes = ridiculously fun Saturday? If you think so, sign up for Hill and Go Seek this Saturday evening at 5 PM. For $20, teams of two cyclists can compete by visiting points of interest and performing tasks at checkpoints. Points are awarded for speed, checkpoints completed, and creativity, and the winning teams will be announced at the after-party at the H Street Country Club. Prizes include Nationals tickets, t-shirts, WABA and Capital Bikeshare memberships, and gift certificates to various Capitol Hill restaurants. You can register online now, or show up as early as 3 PM on Saturday to sign up. Does riding Metro count as my exercise for the day? It’s no surprise that there’s a correlation between rates of people driving to work and higher rates of obesity, but GOOD has created a fun new graphic that shows it in an interesting way. This map of the US shows rates of walking, biking, and taking transit to work alongside obesity rates. Since DC is compared to more spread out states, we obviously come in first place in the walking/biking/transit commute rates, and we’re third lowest (behind super-active Colorado and Connecticut) in statewide obesity rates. The typical caveat applies here: when DC is compared to states the results should be taken with a grain of salt. Virtually any dense city would beat out statewide averages in terms of rates of taking non-motorized transportation to work. 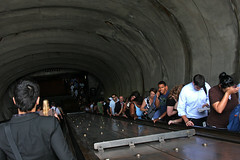 And we shouldn’t pat ourselves on the back too much– there’s still a lot of work to be done to reduce obesity in DC. While overall the District may be considered healthy and active, the obesity rates in Wards 7 and 8 are nearly double the District average (and much worse than the national average). But still, next time you’re stuck walking up a broken Metro escalator, remind yourself that it’s keeping you fit! Hey Ladies: Wine, Food, and Bikes! Hey all you lady cyclists (or would-be cyclists) out there– just a heads up that Revolution Cycles is holding two Ladies’ Night gatherings this month with free wine, food, and great biking information. This Wednesday, head out to the Crystal City Revolution Cycles from 6:30 to 8:30, and next Thursday August 12, head to the Georgetown shop from 6:30 to 8:30. Women from the Revolution Cycles team will discuss where to ride, why to ride, and how to ride safely and comfortably. The point of these sessions is to reduce barriers so we all feel more comfortable riding around the city. It doesn’t matter if you’re a serious triathlete or a casual bike commuter– we all need to know how to change a flat and how to properly maintain a bike. So come for the bike knowledge, and stay for the wine and refreshments. All they ask is that you RSVP for Crystal City (8/4) or Georgetown (8/12) beforehand. See you there! Sad news to start out the week: Friday night around 10:45, David Haywood Williams was riding his bike along Southern Avenue SE when he was struck by two separate cars and killed. The driver of the first car stopped, but the driver of the second car sped off when paramedics arrived at the scene. Police are still searching for the driver of the second car, a dark blue compact Toyota or Nissan. It’s a sad reminder that even though DC is becoming more bike-friendly by the day, both cyclists and drivers should be aware of and respectful of one another. Please take a moment this morning to check out the League of American Bicyclists tips for cyclists and motorists to share the road safely. If you didn’t know it from Bike DC or Bike-to-Work Day or the other bike-related events in the city, May is National Bike Month. And in honor of National Bike Month, we’ve got some bicycling myths to bust. I’m a recent convert to commuting by bike, and now I love cycling around the city. But there are lots of myths out there about the safety and legality of cycling in the city. 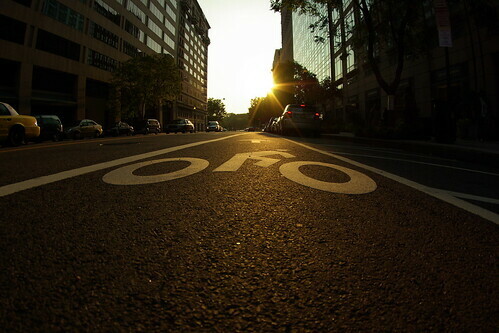 Is DC a bike-friendly city? Is it legal to ride on sidewalks in the District? And how does one go about starting to bike to work? 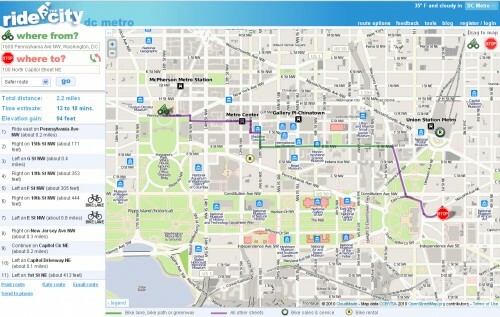 2012 Giro d’Italia To Kick Off In DC? We got a phonecall from our friends at WCSA and it seems that Velonation has jumped the gun. Tomorrow’s event is only a rally in support of DC’s bid and not an actual announcement of DC’s formal involvement. We regret the error and hope to post this story again soon. Tomorrow, according to Velonation, Mayor Fenty, Italian Ambassador Giulio Terzi di Sant’Agata and Giro d’Italia organizer Angelo Zomegnan will announce that the first stage of the 2012 race will be held in DC. This will mark the first time a Grand Tour event has ever been staged outside of Europe. 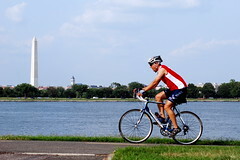 The Italian periodical, Il Sole 24 Ore, reports that the 2012 race will begin on Pennsylvania Avenue in Washington, by the National Archives, will then pass by the FBI building, Freedom Plaza, the Ellipse, move behind the White House, onwards to the obelisk at the Department of State, Virginia Avenue, Watergate, Rock Creek Park and back. The riders, coaches, press, staff, etc. will then get on a plane, fly to Italy, land the next morning, have the day off and then bike their little biker butts off for the rest of the race. Phew! Better start carbo-loading. This is great news for the US, as cycling continues to increase in popularity, and for DC, as we’ve got a strong biking community and because we’re obviously a wonderful host city. Walk in the street two abreast. Drive too fast on slick roads. 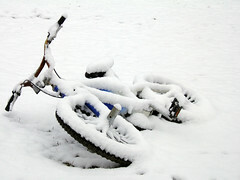 Ride your bike like a jackass in these conditions. Cross the street against the light. Let’s be careful out there, folks. Safety is a shared responsibility. I have seen blatantly stupid behavior out there. If you are driving, slow down and accept that traveling will take a little longer for a while. If you are walking, be smart. Walk against traffic, on the sidewalk if you can, and single file. If you are biking, simply try your darndest to follow traffic rules. Those cars you are used to barely not hitting you are going to have a harder time braking in the slush and snow, so don’t bike like a d-bag. DC residents, are you feeling bad that you can’t get the folks at Bike Arlington to map our your commute for you by bike because you’re not an Arlingtonian? Well here’s a new cool little biking tool that will help you get around the District: Ride the City. Enter your starting location, your ending location, and whether you want a “safer” ride, a “safe” ride, or the most direct route, and Ride the City will chart a course for you. They’ll also tell you the elevation gain, approximately how long it will take, and which parts of your ride include bike lanes– and you can rate the route to provide feedback. This just made biking around the city a lot easier. Now, if only they could show the nearest bike racks to your ending location! We all love to complain about our commutes– by Metro, by car, and by bus– and we all think that we have it worse than most people. Well, the folks at Bike Arlington think that biking is usually the most efficient way to get around in the city, and they’re willing to put it to the test. If you start or end your commute in Arlington, tell Bike Arlington about it– where you commute, what mode of transportation you use, and how long it typically takes– and they’ll tell you if it’d be faster to bike to work. They’ll ride your route on bike, time it, and tell you if it beats your current commute. How great is that? I’ve always wondered if biking would be faster than a typical Metro commute, and this is the perfect opportunity to try it out without having to figure out a route for yourself. Stay tuned for updates on Bike Arlington’s twitter page, and keep an eye out as a WeLoveDC author puts her hellish commute to the test! 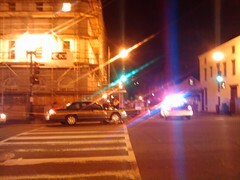 Update: More details on the accident from WashCycle. Also mentioned on Georgetown Metropolitan. No mention on the MPD-2D mailing list. Anyone else see what happened? New Bike Lanes on 15th Street! 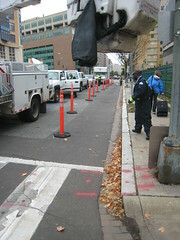 If you’ve been on 15th Street NW this past week, you’ve probably noticed the construction of a new contraflow bike lane. This lane will be open early next week, allowing bicyclists to travel south on northbound 15th Street NW. This improvement project also includes ‘sharrows’, or painted arrows reminding motorists to share the road, for northbound bicyclists. 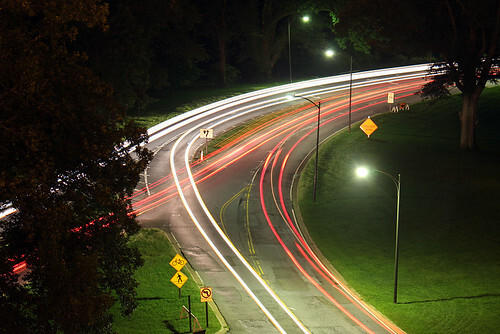 As a major commuting artery in the city, 15th Street is notorious for being car-dominated– the four lanes of one-way traffic seem to really encourage drivers to speed. I live a block off 15th Street and feel like I’m taking my life in my hands every time I have to cross at my unsignalized intersection. So here’s hoping the new bike lane will lead to a more balanced mix of transportation that is pleasant and safe for pedestrians, bikes, and cars. Even though women make up only about a third of all bicyclists in this country, they’re considered an “indicator species” for urban bikeability, according to a recent report in Scientific American. The article says that women prefer bike routes that aren’t shared with cars, and they are more likely to go out of their way to use safer bike infrastructure. As cities learn how to design places that accommodate women’s biking preferences, researchers think more people in general will start biking. 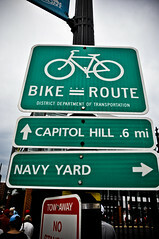 So female cyclists, what do you want to see in DC? This event sounds like a good start: this Saturday, Sports and Spinal Physical Therapy is sponsoring a Women, Wheels, and Wellness Day in Glover Park. The free program includes yoga for cyclists, an urban cycling skills session, as well as door prizes and giveaways. So women bikers, head over to Blue Ridge on Saturday afternoon for all sorts of good stuff– and realize that you’re the wave of the future! The Crystal City Business Improvement District just announced a new program coming in the Spring of 2010: a 100-bike Commuter Hub, which will offer bike rentals to commuters, tourists, or residents. The Commuter Hub will be located at 220 Twentieth Street, a new LEED-certified apartment building in Crystal City. Revolution Cycles will manage the retail and rental business, which will also offer repairs and bike accessories. 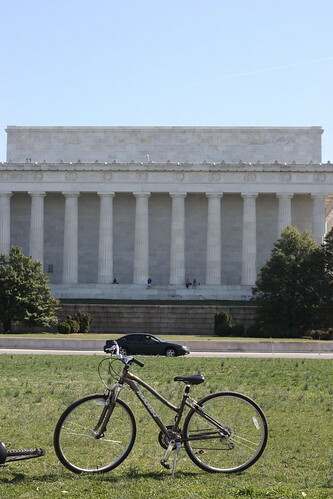 Bike rental establishments in our region typically cater to tourists, who can bike around the monuments and parks while sightseeing. But the Commuter Hub is marketing itself differently– by capitalizing on its location near area trails and bike routes, it offers nearby office workers a chance to rent a bike and explore the trails during lunch. I’m all for opening up bike options to more area residents, and think that this could be a great option for people interested in trying out biking around town without a huge commitment. Bike to Work on the Metropolitan Branch Trail! 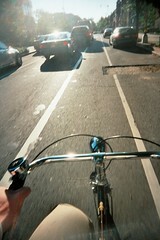 Now that it really feels like fall here in DC, it’s the perfect time to start riding your bike to work. But doing so can be a little intimidating for a first-timer having to negotiate potentially bike-unfriendly roads alone. If you live in Silver Spring, Takoma, Brightwood, Brookland, Fort Totten, Edgewood, or Eckington, you’re in luck– the Metropolitan Branch Trail is a great way to bike right to downtown DC. And even better, Rails to Trails is organizing Monday Morning Commute Convoys on the Metropolitan Branch Trail every Monday morning in October (except for Columbus Day). Rails to Trails folks will lead bike convoys from designated locations along the Metropolitan Branch Trail and head off to Dupont/Shaw, NoMa/Judiciary Square, and Chinatown/L’Enfant Plaza. It’s a great way to ease into bike commuting and see how well the trail connects these DC neighborhoods with downtown. If you’re interested in joining the convoy, sign up here (registration is required). And even if you can’t join the convoy, check out the Metropolitan Branch Trail sometime– even though it’s not yet 100% complete, it already offers a great link through some of DC’s beautiful historic neighborhoods. 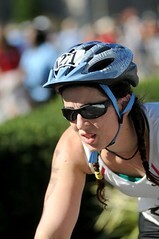 You won’t believe me, but triathlons are ridiculously fun. Swimming, biking, and running back to back to back for 32 miles sounds exhausting and painful to the uninitiated, but yesterday at the Nation’s Triathlon I had the time of my life. And let’s put this in perspective, a year ago I could barely run a mile. But with the great resources that our city has to offer, from free pools, great biking trails and an active triathlon community, DC has made a triathlete out of me. 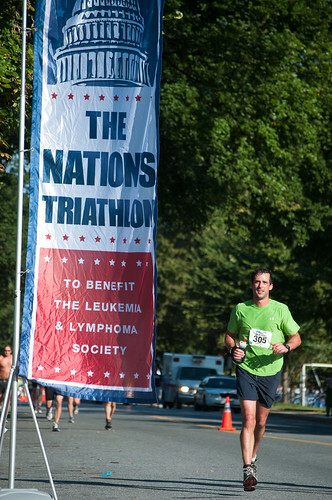 The Nation’s Tri, which marked its fourth year yesterday, was a fantastic event from start to finish. It has grown from 500 competitors in its first year to 6,000 registered competitors today, and it’s easy to see why: it’s professionally managed, takes you through some of the most beautiful parts of the city, and well, where else can you swim the Potomac with the mayor? Union Station Bike Center (AKA “BikeStation”) looks pretty much done at this point — outside, at least. The construction fences and tarps are gone, and the parking garage driveway to 1st St NE has been open now for a few weeks. Station-area bicyclists should soon have a nice, sheltered, secure spot to store their bikes here. 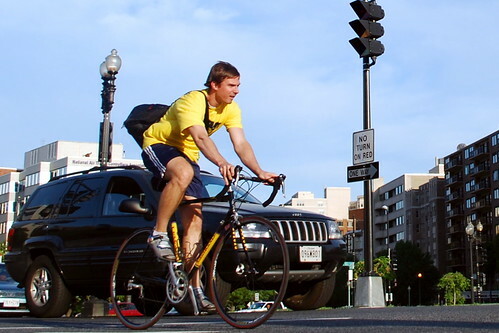 Last Friday, more people participated in DC’s Bike to Work Day than ever before — about 8,000. Even U.S. Energy Secretary Steven Chu took part, riding in on his $5,000 bike and speaking to the crowd. Now, my bike cost just a wee bit less than that and works just fine, but kudos to him for bucking the Secret Service and commuting carbon-free. Perhaps by now you’re jazzed to commute by bike, or you’ve pulled out your spiffy fuschia spandex and are ready to zip along the city streets for kicks and giggles. What do you know about playing in traffic? Anything? Luckily for you, folks are willing to teach you the rules of the road — and you might be surprised by what you learn. City Bikes is at it again with their group rides, except this time it’s pairing two of my favorite things… my gorgeous bike with CUPCAKES! Food + Bikes = yay! The bicycle-enthusiast and pastry chef for Tryst, Open City and The Diner, Sol, is partnering with City Bikes to create the Cupcake Ramble, a relaxed easy/moderate paced group ride. The ride starts at City Bikes Adams Morgan, through the car-restricted Rock Creek Park, to City Bikes Chevy Chase. “Once there, we’ll enjoy pastries baked by Sol, before heading back to City Bikes Adams Morgan,” says the ride description. To sign up for your guilt-free cupcake intake, head on over to the City Bikes Web site. 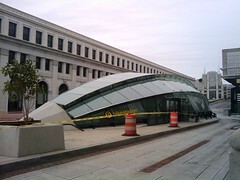 There’s lots of news everywhere regarding Metro and Inaugupocalypse, so I don’t see a need to rehash all that here. Instead, I’ve been intrigued with a lot of referencing lately to cycling in the District, especially as an alternate form of travel. I was thinking it might be a good idea to run down some of the rules and guidelines for biking in the District, for both cyclists and drivers to remember.